Here we are, in the thick of a PCS summer. 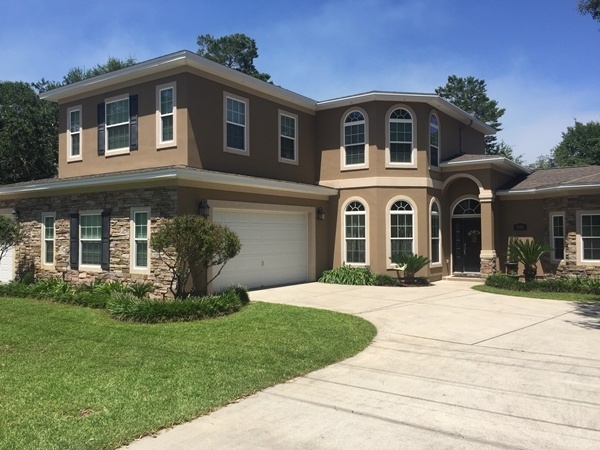 If you still haven’t found a home near Hurlburt Field, Florida, no sweat. MilitaryByOwner has several to choose from in this week's collection of Homes of the Week. By the way, when we say no sweat, we mean no sweat, because each of these homes has a pool right in the backyard. No beach sand mess in the car, no forgetting the sunscreen, no heavy coolers to drag--everything you need will be just a few steps away. 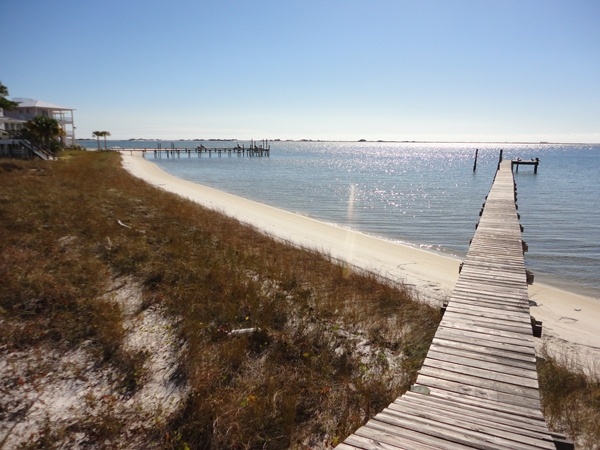 Choose from properties in Niceville, Fort Walton Beach, or Navarre to bask poolside in the Florida sunshine! This home photographs so beautifully due to the open concept living design that allows plenty of light to stream through each of the well-appointed rooms. Throughout the house, you’ll appreciate architectural details not found in most homes. Impressive crown molding, coffered ceilings, and built in cabinetry elevate the property to an enviable status. 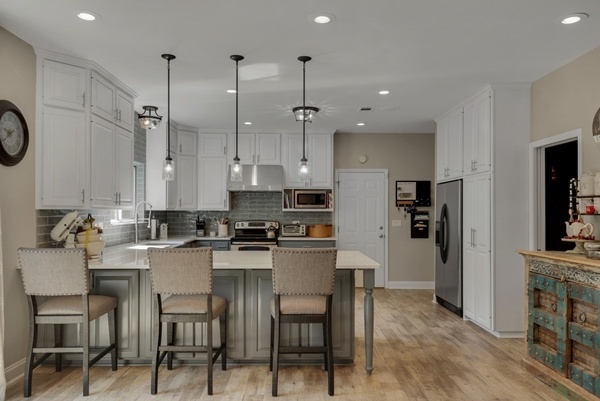 Recent exterior and interior renovations include a Pinterest worthy kitchen with a stunning backsplash that reaches from ceiling to countertop. Outside, golfers will delight in the close proximity to the fifth green of the Marsh Golf Course. The entertainer in the family will fall in love with the resurfaced pool and outdoor living space. 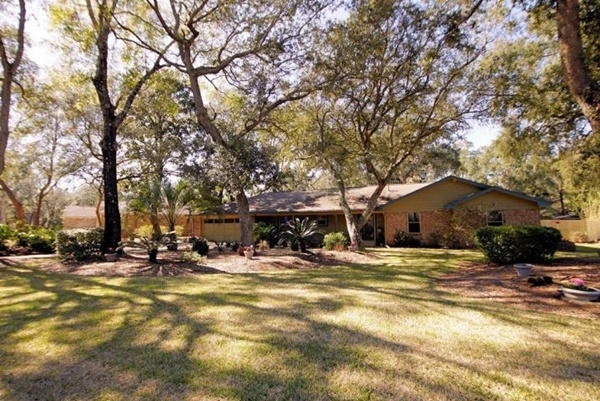 Lush landscape provides exactly what a homeowner needs in Florida—plenty of shade for relaxing! Set in a resort-like atmosphere amongst the trees, an enclosed pool and hot tub await the next owners. There’s no need to travel very far while living here. Take a staycation in the Florida room while sipping cool cocktails in easy breezes. 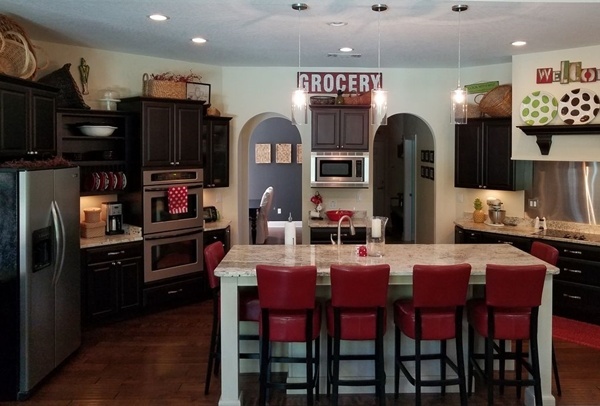 You won’t have to dread carrying groceries up the stairs in this brick ranch style home, nor will you have to worry about the storage space in the kitchen for your purchases. The spacious galley kitchen has been updated and features a breakfast bar and dining nook which overlooks an oversized family room. The rest of the living spaces are outfitted with cool to the touch tile, keeping maintenance low. The master bedroom features a sliding door for direct access to the Florida room. The master bath has also been renovated and provides the owners with a large shower and the often-requested dual sink vanity. Picturesque truly describes the backyard oasis of this home. Mature landscaping, tall palm trees, and an outdoor kitchen play off the convenience of having a sparkling pool in your private backyard. The memories the fenced-in property will provide your family are priceless. With plenty of space inside to host family and friends, yours will be the home everyone wants to gather for holidays and Sunday dinners. 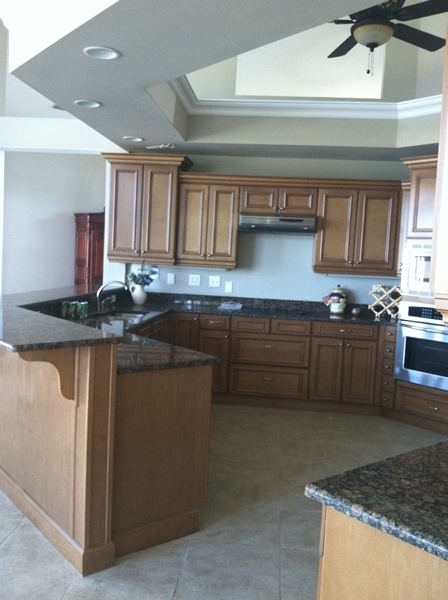 Don’t worry; ample kitchen space and the stainless appliances will accommodate anything you need to prepare. Everyone can rest easy within the three bedrooms upstairs, with the master located downstairs for simplicity and privacy. For all kinds of entertainment options, send the kids upstairs to play in the game room. 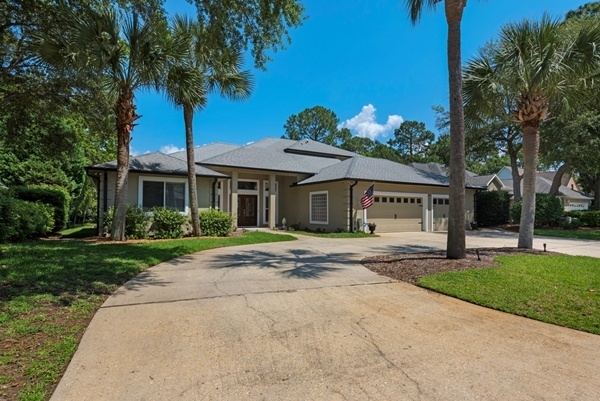 The custom-built home has convenient access to Eglin AFB and Hurlburt Field, as well as the airport. A couple more features of note: property is a corner lot and has access to a golf course. Check out the virtual tour for even more gorgeous photos! 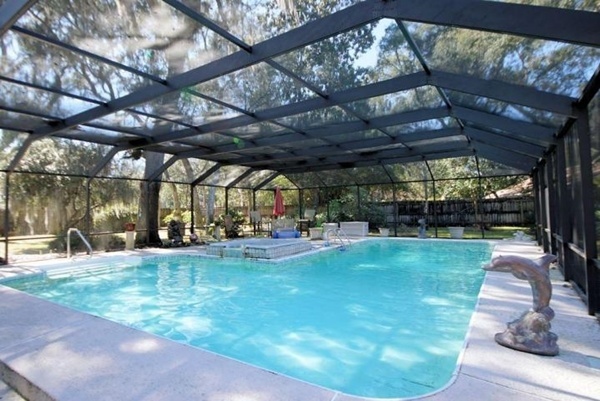 Ok, so what could be better than a refreshing pool in your own backyard? 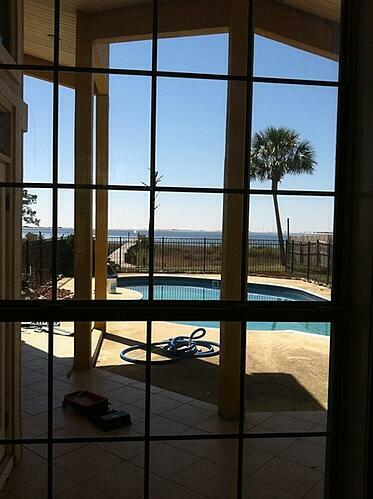 How about a home with a private pool AND direct access to amazing white sand beach? 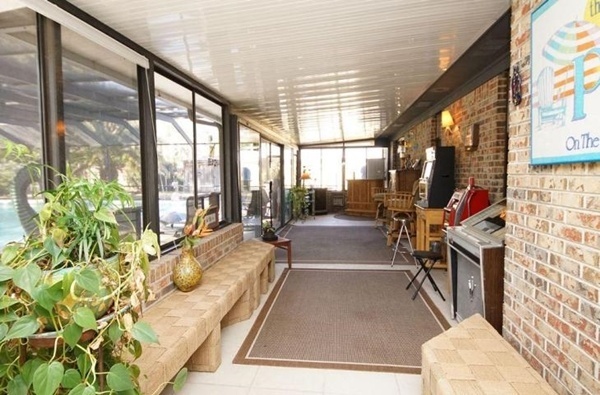 This property is sound front and has a deep-water boat slip. A 400-foot personal pier awaits your sunrise coffee and lounge chairs. Those who hate carpet are in luck because not one inch is found inside; tile covers the floors. Open concept living is accentuated by the high ceilings and substantial moldings not only on the ceilings, but around doors and windows. Granite counter tops are in the bathrooms and kitchen. Bathrooms boast walk-in showers with travertine tiles and stonework for an updated look. For more storage options, the two-car garage holds more than cars because of the deep sizing dimensions. Plus, there’s enough room for a workshop. If it’s a pool you want, then it’s a pool you’ll get! 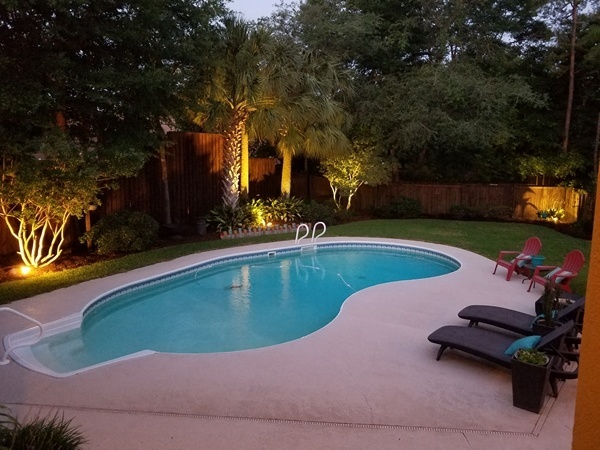 MilitaryByOwner has many homes advertised with pools (even rentals! ), and not just in Florida. Use the Advanced Search Filters and choose the drop-down menu under Listing Features. There, you can check out which homes have ready made fun and pool entertainment for years to come.